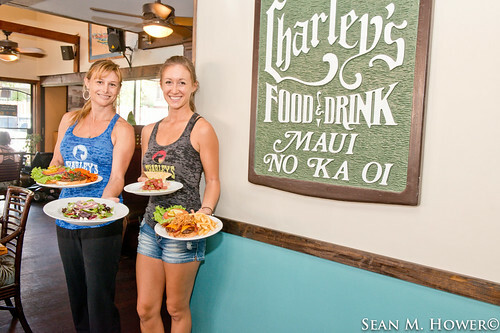 With all the changes that are going on in Paia, it’s nice to know that Charley’s Restaurant and Saloon isn’t going anywhere. 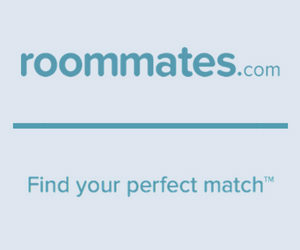 They aren’t planning a huge makeover, either. So far in the three or so years since Jonathan Herman procured the establishment, he’s been making subtle changes to the menu with the idea to keep Charley’s good for what it’s known for. 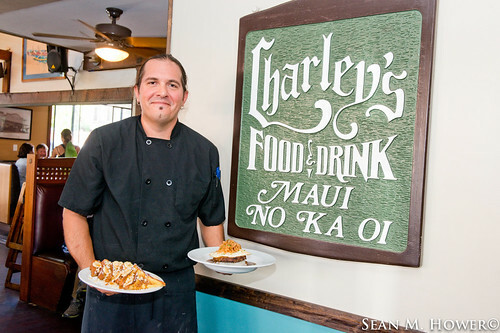 “Our goal with Charley’s is to continue to dramatically improve the food and service, offering as much locally sourced products as we can, while keeping our prices appropriate for those people that live in Maui year-round,” he says. He’s in good hands. Chef Chewy Cereceres has a background in fine dining, with his last gig as Executive Chef at Hali’imaile General Store. He’s been at Charley’s just about a year, and if the crowd this past Sunday morning is any indication, the food is slamming. Cereceres says it was a big change in dining concept, but he says his kitchen crew is working well now. He even has a new toy in the kitchen–a smoker–and a new BBQ menu should be rolling out in the next month or so. I was excited to hear his smoker is working on recipes for all proteins: pork, beef, chicken and tofu. This is Paia, after all. Cereceres has taken Charley’s breakfast standards up a notch, adding some beautiful touches. 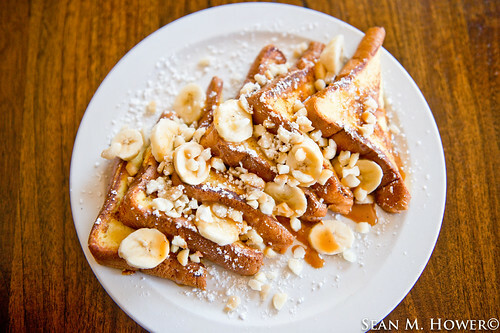 Imagine thick cut French toast with caramel, bananas and mac nuts or pancakes in every flavor–blueberry, whole wheat, chocolate chip–all covering a 10-inch plate. Fluffy buttermilk biscuits smothered in sausage gravy passed the discerning Southern palate of my breakfast cohort. The breakfast potatoes are crisp and flavorful, served around the Eggs Benedict perfect for dredging up tangy leftover house-made hollandaise. 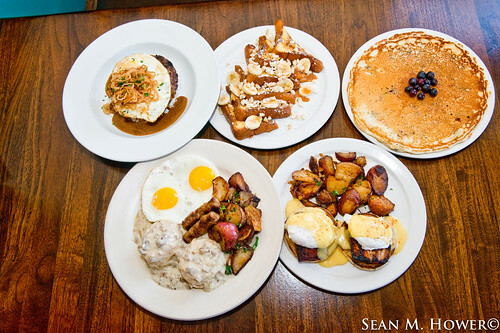 The Benedicts come in veggie, turkey, mahi, blackened mahi and traditional versions. 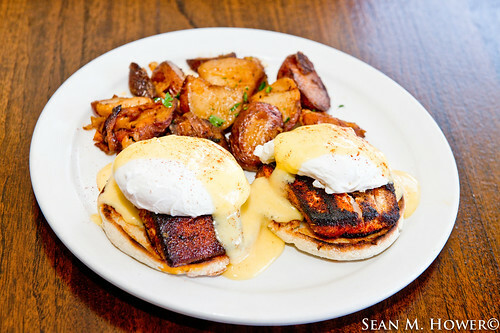 My blackened mahi Benedict was a good twist on the original–and still just $12 for a full order. The loco moco is a half-pound, pasture-raised, hormone-free beauty, piled high with crispy onions and smothered in a luscious mushroom gravy. 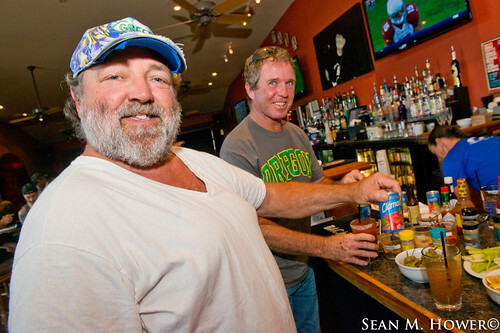 Sunday mornings at Charley’s also features their super-fun do-it-yourself Bloody Mary bar. I have to admit Charley’s makes some of the best damn Bloodys around, stuffed with celery and green olives, but there’s a lot of merrymaking around the DIY table. Here’s our hack: do it yourself at least once to make new friends at the bar, then have Charley’s make the next one. Vote which was better. At lunch, the menu is extensive. 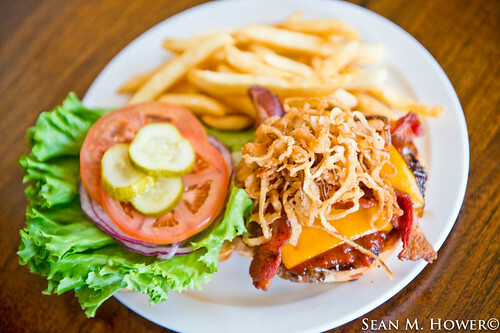 Burgers are famous here, dressed in soft onion rolls with plenty of fancy toppings (the homemade bourbon BBQ sauce really makes the beef patty rock your tastebuds, so don’t leave without trying it). Veggie heads have lots of options like smoked tempeh and Maui Taro patty burgers. Starters like ahi poke are inspired with teriyaki and ginger slaw and will be quickly devoured. Their Mediterranean Salad is made with a local touch–mac nuts meet feta on Haiku greens with a Meyer lemon vinaigrette finish. 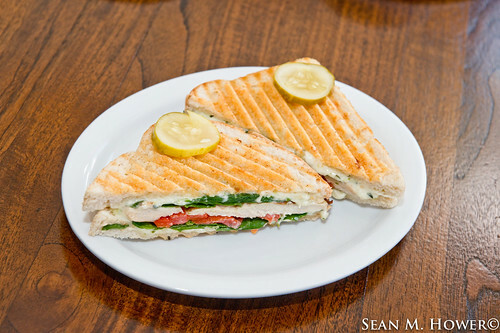 The paninis and sandwiches are also spectacular. I loved the Grilled Chicken Pesto, stuffed with mozzarella and roasted red pepers and served on a crisp sourdough and parm crust. The Meat Lover and Smokey Joe are served on hoagies, and the Veggie Lovers sounds amazing with its arugula, sunflower sprouts, avo-Greek yogurt and tempeh bacon served on Maui Crunch Bread. It’s enough food for lunch and leftovers. They also have pizzas made on Charley’s house-made dough with gluten-free versions available. Chef Chewy recommended the fried chicken which blew me away. Tender boneless breast meat blanketed in buttermilk sounds simple, but it has been made into a work of art at Charley’s. Plus Friday nights its just $13. The dinner hour features lots of the lunch dishes, only more expanded. Chef Chewy recommended the fried chicken, which blew me away. Tender boneless breast meat blanketed in buttermilk sounds simple, but it’s a work of art at Charley’s. Plus, on Friday nights it’s just $13. Charley’s has a couple kama’aina specials. There’s their Everyday Ohana Pizza party ($32): A large two-topping pizza, two large salads, two desserts and soda. Then there’s Tex Mex Tuesday: soft and hard shell tacos, burritos and taco salads. 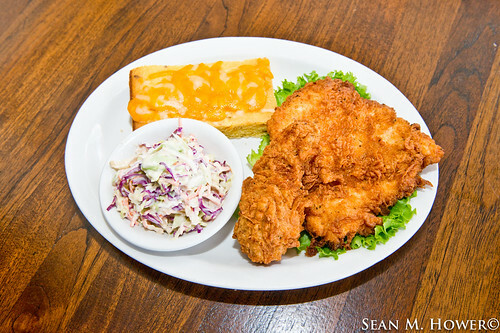 And the aforementioned Fried Chicken Friday. Happy Hour takes place every day from 3-6pm, with $3 drafts and wells and $4 house wine. Live music starts at 6:30pm on Tuesdays, Wednesday and Thursdays, and every Monday has open mic at 7pm. This Friday, Pio Marasco and Sandwich Island Bass present Mezzanine at 9:30pm, and Saturday Justin Morris hosts Freeradicals Projekt with Sicnickles at 10pm.